During this 4-day immersive class in personal essay and memoir writing, we will explore this intimate and creative way of writing. Whether you’re a blogger, journalist, writer or just longing to write about your memories, this retreat is for you. But our workshop is not limited to writers! If you are a chef or caterer, a PR person, cooking teacher, or home cook, you have stories to tell, too! How to write about the people in your life, both the living and the dead. How personal should your personal writing be? How to make your readers care. Free your natural storytelling voice and strengthen it. Inspire your creativity and explore your writing passions. Discover which publications and websites want your personal stories and how to pitch and sell them. While we have both written professionally for years, we are increasingly drawn to personal stories as a way to process our own thoughts and emotions. We write about family, love, loss, longing, and identity, often through the lens of food, in our multiple award-winning essays and blogs (see links below in our bios). Together our group will explore this unique form of writing based on personal experiences. Writing exercises and animated roundtable discussions will help you move forward, whether writing pieces for blog posts, freelance articles, memoir or cookbook essays. You will have quiet time to write, followed by time together to share and discuss your work. The weekend features culinary excursions unique to Chinon and the Loire Valley. There is a wine tasting followed by a wine-paired meal at a family-owned wine domain, the Château du Petit Thouars. 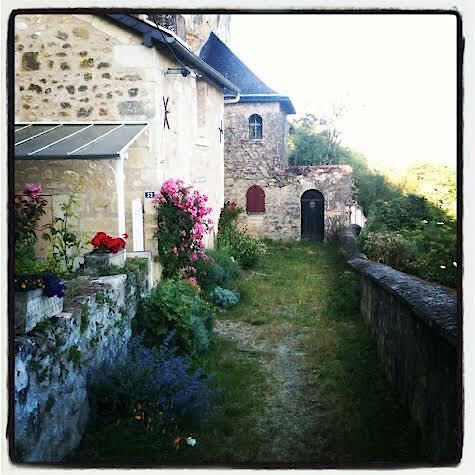 The retreat offers time to wander Chinon’s farmer’s market and old town, as well as a meditative walk to the fortress above. 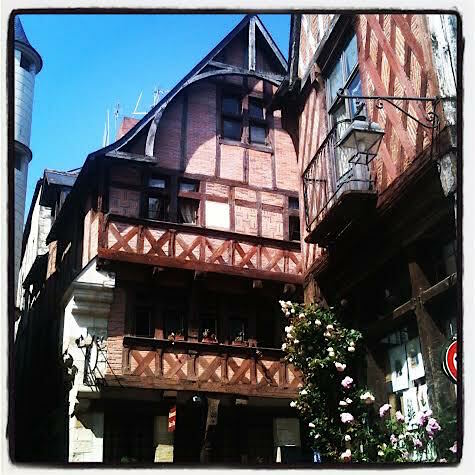 Inspired by the beauty of a cobbled French town, lovely lodgings at a 15th Century hotel, and practical exercises and prompts, you will take your ideas and writing in new directions. Towards the end, each participant will have a 30-minute, personal, one-on-one consultation with each instructor. This is our second writing workshop together. 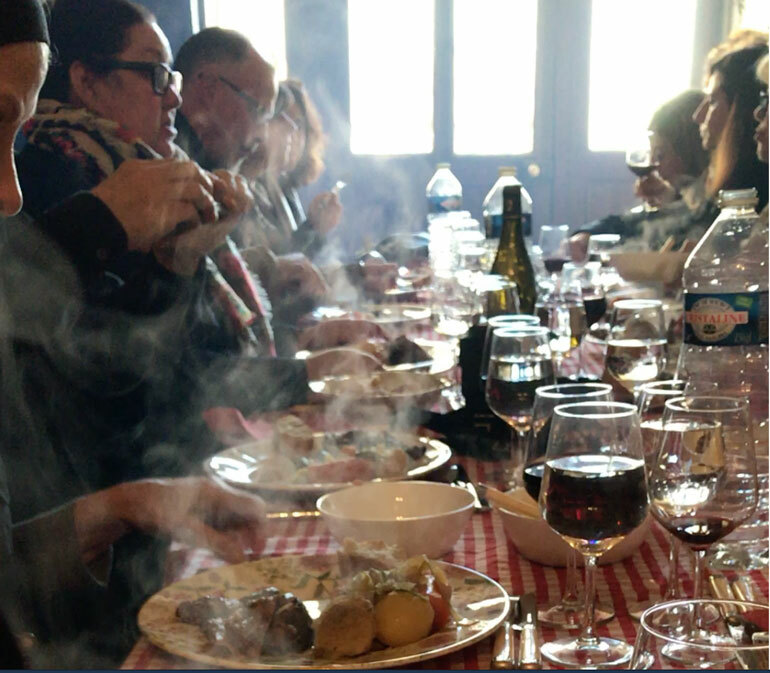 To read about the first one, see A France Workshop on Food Writing. 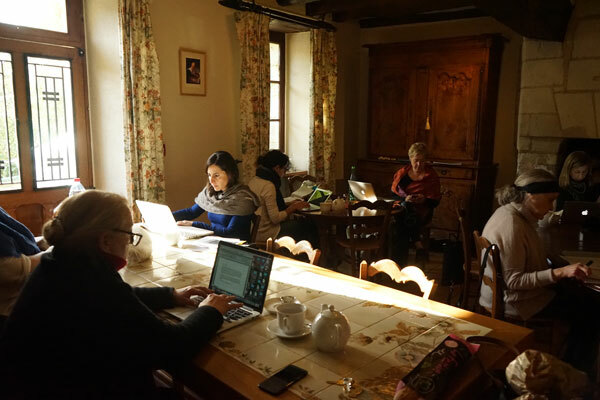 Our Memoir Writing Retreat begins the afternoon of Wednesday December 5 and ends Sunday December 9 at noon at the Hôtel Diderot, an enchanting 27-room auberge de charme dating from the 15th and 18th Centuries. It is located in the center of the medieval French town of Chinon, nestled in the Loire Valley, about 150 miles from Paris. The cost of the workshop is €1750*. This includes all workshop sessions and one-on-one private consultations with Dianne and Jamie, accommodations for 4 nights at the Hôtel Diderot, 4 breakfasts, 3 dinners including one at a local restaurant, 3 lunches, and the tour, lunch with wine tasting at the Château. Workshop cost will not include airfare or transportation to or from the venue or insurance. * As the price of the workshop is in euros, please check the exchange rate for your local currency on the day of purchase. 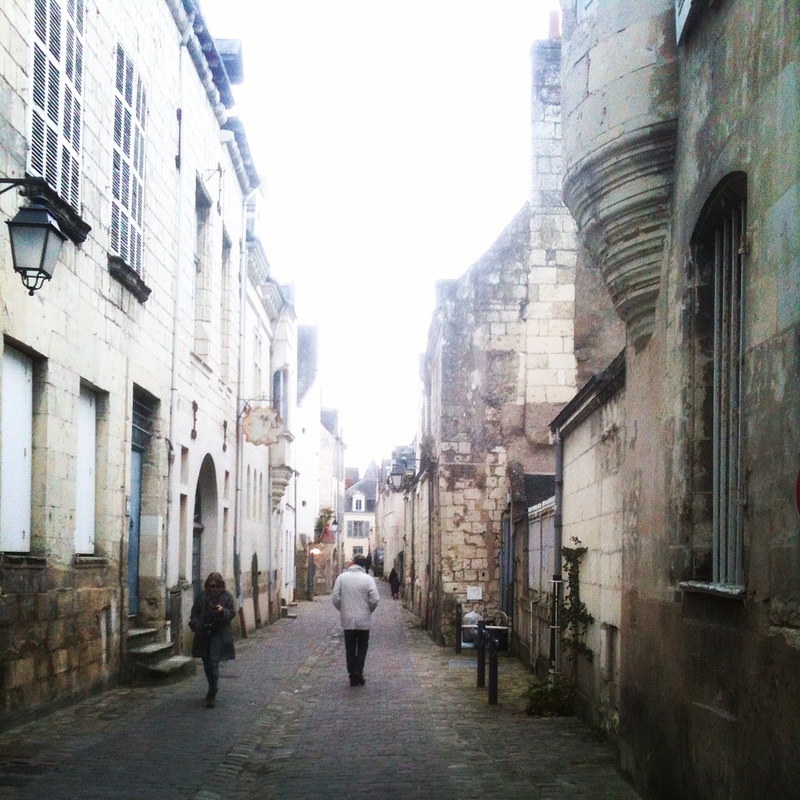 Jamie Schler (left) is an IACP award-winning writer and hotel owner in Chinon, France. After working as a culinary guide in gastronomic tourism in Paris and as interpreter at the prestigious École Ferrandi in Paris, and recipe editor and assistant editor for Master Chef magazine, she combined her passions for food and storytelling to forge a career as a writer specializing in food, culture and family. Jamie’ first cookbook Orange Appeal was selected by Southern Living Magazine as “one of our favorite books of the season” and was written up in The Chicago Tribune, The Jerusalem Post, The San Diego-Union Tribune, The Post and Courier, and Natural Awakenings Magazine. She has spoken and taught at events and workshops around the world, including Muscat, London, New Orleans, Cape Town, San Francisco, Chicago, Louisville, New York and at her own workshops around Europe since 2010. 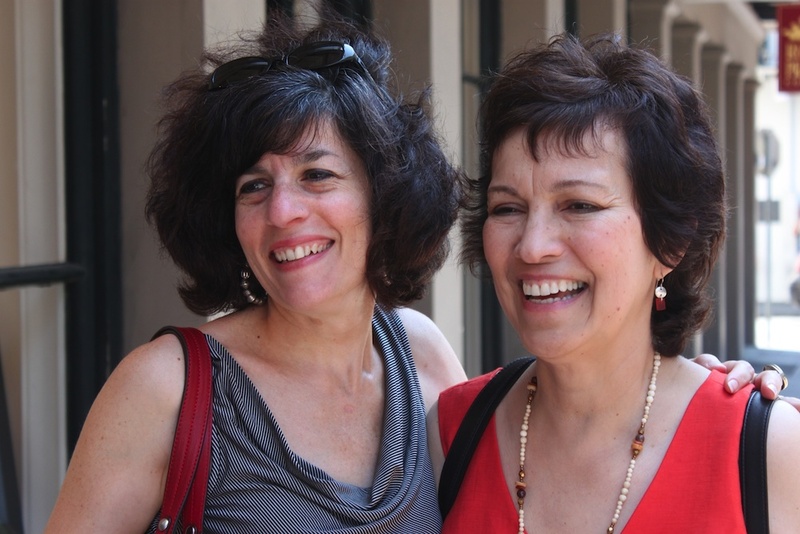 Dianne Jacob (right) is the author of the multiple award-winning book Will Write for Food: The Complete Guide to Writing Cookbooks, Blogs, Memoir, Recipes, and More. A former journalist and publishing company editor-in-chief, Dianne is a full-time writing coach, author, and freelance editor. She has spoken and taught at events and workshops around the world, including London, Dubai, Vancouver, Turkey, and Australia. Her personal essay, The Meaning of Mangoes, published in Lucky Peach magazine. Grand prize winner, MFK Fisher Awards for Excellence in Culinary Writing, Les Dames d’Escoffier. Best Essay, Association of Food Journalists. Included in Best Food Writing anthology, 2016. She is working on a memoir based on this essay. She has written personal essays for many other publications, including The Washington Post, for which she wrote The little egg device I’ll never get rid of, because it reminds me of Dad. She is also the co-author of two cookbooks with Chicago chef Craig Priebe. Her second book, The United States of Pizza, was recommended by The New York Times, The Boston Globe, and NPR as one of the best cookbooks of the year. The United States of Pizza also won a 2015 national award for cookbooks from IndieFab. their first cookbook was Grilled Pizzas & Piadinas. Her well-known blog Will Write for Food is aimed at writers and covers trends, issues, and techniques. Learn more at diannej.com. 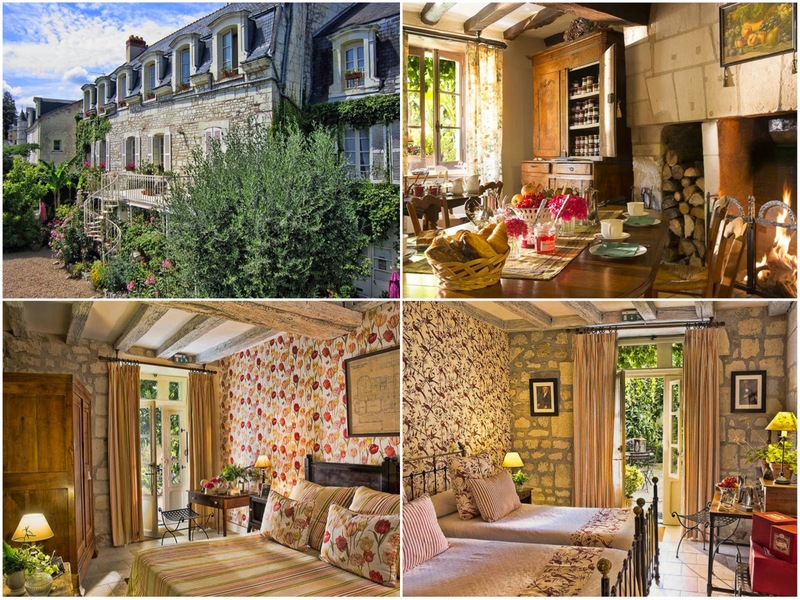 The Hôtel Diderot is an enchanting 27-room auberge de charme dating from the 15th and 18th Centuries in the center of the medieval French town of Chinon on the banks of the Vienne River. Visit the website here. 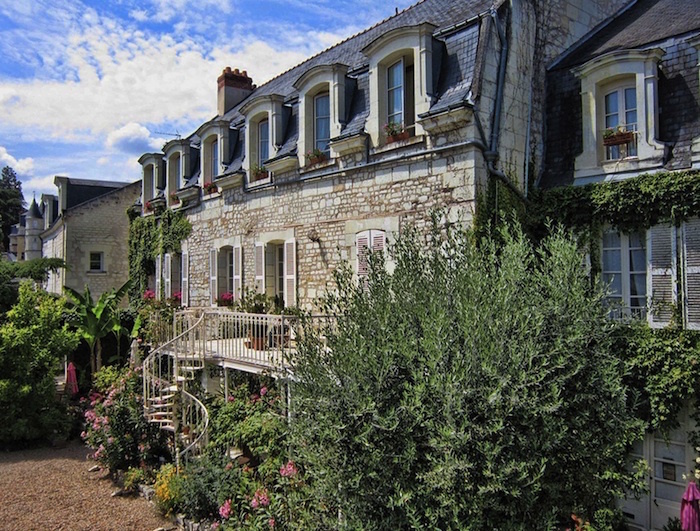 The hotel is situated a stone’s throw from the center of old Chinon, a stone’s throw from the Château de Chinon, a UNESCO World Heritage Site, and in the heart of the Loire Valley and the Chinon vineyards. Chinon has inspired such great writers as native son François Rabelais, author of the tales of Gargantua & Pantagruel and Honoré de Balzac, author of La Comédie Humaine, who sojourned just outside the city for many years. The newly renovated fortress perched majestically above the hotel and the city’s center, long the royal demure of the French and English courts, was where Joan of Arc first met Charles VII. The city of Chinon, nestled in the lush and temperate Loire Valley, is an important wine region producing world-class wines, stunning reds from the very old Cabernet Franc grape, rosés, and whites. Chinon wines, whether light and fruity or bold and complex, pair perfectly with the local river fish, asparagus, berries, fresh or aged goat cheese, pork rillettes and rillons, or the unusual poire tapée. The valley surrounding Chinon is famous for saffron, apples and pears, and has become France’s major producers of black truffles, la Truffe Rabelaisienne. And don’t leave without tasting the tarte vigneron! For a small town, Chinon is a privileged gastronomic destination with a generous selection of excellent restaurants and bistros gourmandes.